Politicians have over-hyped the potential of fracking and the prospect of shale gas says the Imperial College-based UK Energy Research Centre (UKERC), as conveyed to us by the wonders of the Guardian website. The Centre then goes on to say that the idea of Britain becoming self-sufficient in gas again is far-fetched. We became a net importer gas in 2004 as North Sea production declined, and the coalition has heavily promoted shale gas on the grounds of energy security and economic growth. However, significant shale gas production in the UK is unlikely to get underway until next decade and will not reproduce the American "shale revolution". We are not on course to energy self-sufficiency. 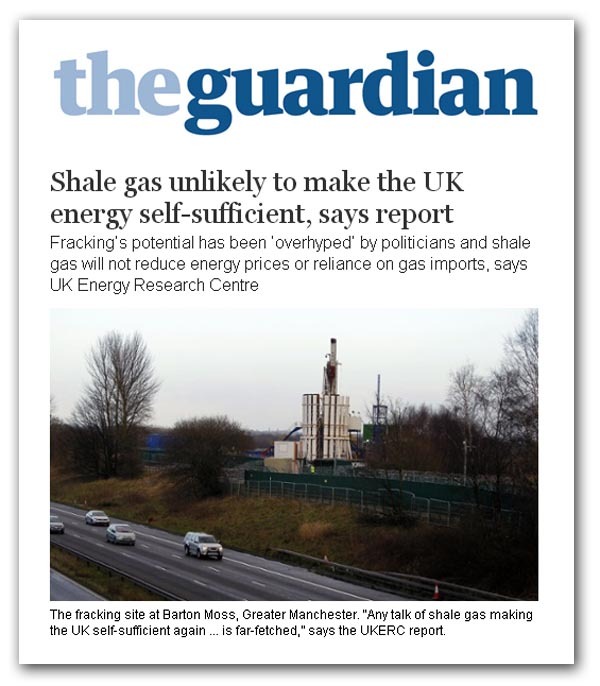 To EURef readers, the "bad news" on shale gas is hardly news at all. But then, UKERC is probably being a little bit too keen to write off any idea of a gas bonanza. That may be because it is in the grip of warmist dogma, pushing carbon capture and storage, while modelling a future were gas consumption peaks in 2025 and declines terminally thereafter. Nevertheless, "shale gas" has become a synonym for unconventional gas and, even if shale doesn't deliver the goods, there are plenty of other possibilities – not least methane hydrate. UKERC is being unduly pessimistic. But even without methane hydrate, there is something more interesting on the immediate horizon – underground coal gasification (or UCG for short). A 2004 DTI report is quite optimistic, suggesting that prospects have benefitted from new underground exploration and production technologies. A recent article adds more, and now, with an admirable sense of timing, we get the news that there has been a major coal find under the waters of the Firth of Forth. Developers Cluff Natural Resources says a report by independent assessors estimates there are up to 335 million tons of coal under the seabed, and now plans to build the UK's first deep offshore UGC plant. More than 43 million tons is said to be suitable for UCG and The Scotsman reports that the resource represents 1,395 billion cubic feet (BCF) of natural gas, enough to power around 15 million homes for a year. This is not a huge amount compared with the three trillion cubic feet used in the UK each year, but it is a start. The UK coal resources suitable for deep seam UCG on land are estimated at 17 billion tonnes (300 years' supply at current consumption) and this excludes at least a similar tonnage where the coal is unverifiable for UCG. The offshore resource seems difficult to quantify, but last year, Fallon was talking about 200-years-worth of UCG supply. If shale does not provide the bonanza, therefore, there is always something else on the horizon - or even under it.